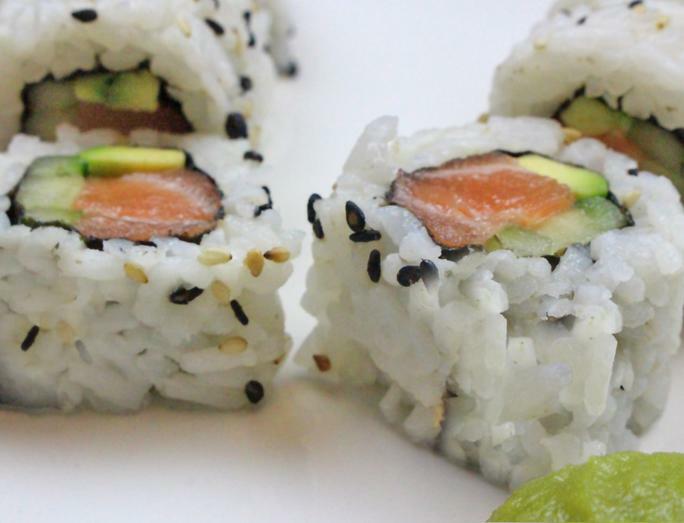 California Roll, Salmon Roll, Tuna Roll and Veggie Roll- These four sushi roll recipes can be made for any occasion! Cook 2.5 cups of short grain rice as package directs. As the rice is cooking, pre slice all vegetables and fish for rolls. Place the rice in a large bowl. Pour Marukan Seasoned Gourmet Rice Vinegar evenly over rice, gently fold to combine. Let rice cool to room temperature. The seasoned Vinegar will enhance the flavor of the rice and keep it fresher longer. Sushi rice is best if eaten soon after it is made. Refrigerate unused rice for later use. Remove Saran Wrap and enjoy! Repeat steps 1-6. For step 7 add salmon, cucumber and avocado then repeat steps 8-13. Repeat steps 1-6. For step 7 add tuna, cucumber, and avocado then repeat steps 8-13. For a tasty dipping sauce use our Marukan Ponzu Premium Soy Dressing with Sudachi Citrus!